- Try to enjoy making daily fresh proxy list by yourself! 1) Logged into the forums with Internet Explorer (not Firefox or Opera). 2) Please select "Log me on automatically each visit" when login. 4) Click the "Start" button in FPL to start leech that forum. After you login the forums, FPL can read your account information from IE. In fact FPL tries to act just as IE. It's same for the forum whether you use FPL to leech or open another IE to read the topics one by one from the forum. If it's your first time to use FPL, here is a good video tutorial for you. Forum Thread: FPL will run faster if the number is bigger. Note that it will make your surfing slow if the number is too big. Topic Thread: It will significantly speed up the leeching process if you set it bigger, but it will cause additional load to the forums. So this option is now only available for registered users. Total Thread: It depends on the Concurrent Forum and Concurrent Topic. FPL will calculate it for you. Time out: If your connection to the forums is slow, please set it bigger, which however will make the leeching process longer. Suggestion: It is recommended to use the default setting. ProxyJudge: The URL is used to classify the proxies. Test it in the browser to make sure it's live before testing. Use a new proxyjudge in our proxyjudge page if the default proxyjudge died. Max Thread: Bleach will run faster if the number is bigger. Note that it will make your surfing slow if the number is too big (more than 100). Save test results in history: Whether save the results in the history folder. 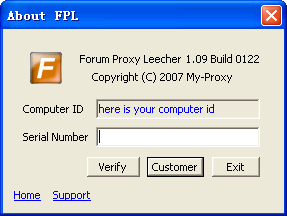 Computer ID: In order to generate the serial number, you may be asked to submit your unique FPL Computer ID in this dialog, which can be invoked by clicking the button with a icon "i" in the FPL main window. Serial Number: We will give you the serial number if you purchased FPL.